Today we are here with CCC Sample Question Answers / Bank Set-C. We hope this will again prove beneficial for all the CCC Exam candidates preparing for the upcoming DOEACC / NIELIT CCC Examination. 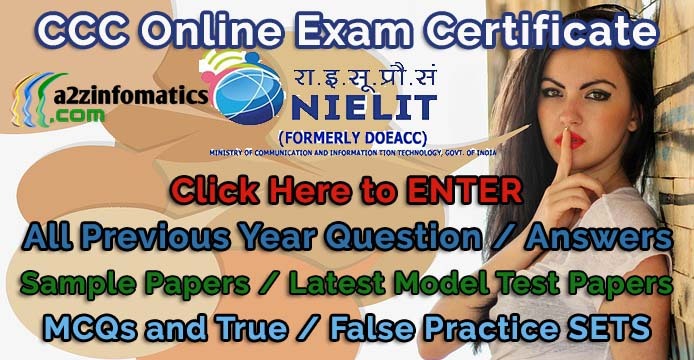 Just go through with all the previous year CCC exam question answers, and you will be able to crack the DOEACC / NIELIT CCC exam at the very first attempt. In addition to these benefits, this MCQ’s with Answers will boost your knowledge base and may help you in other competitive examinations. Best of luck for upcoming CCC Examinations, have you checked the latest CCC Exam Syllabus. 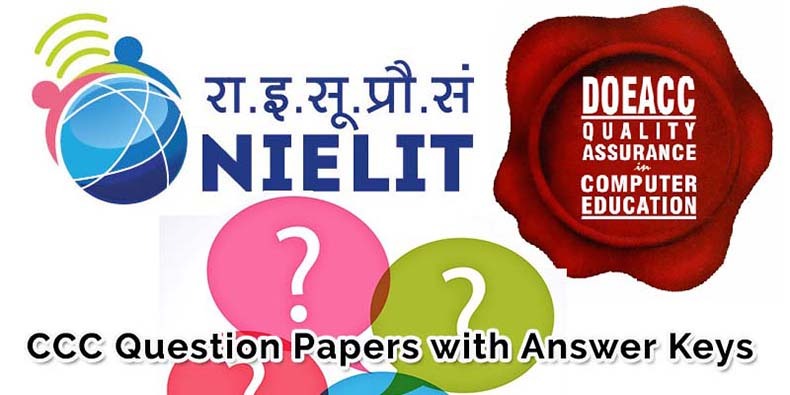 DOEACC / NIELIT CCC Sample Question Answers / Bank – Previous Year CCC MCQ’s Paper SET C.
Note: This CCC Sample Question Paper (SET-C) consist of total 50 question with the answers at page no 4 of this post. Ques 1- Which of the following a search engine continuously sends out that start on a homepage of a server and pursue all links stepwise ? (c) data in more useful or intelligible form. Ques 6- Which of the following is a part of the central Processing Unit ? Ques 7- What is meant by computer literacy ? (a) Ability to write computer programs. (b) Knowing what a computer can and cannot do. (c) Knowing computer related vocabulary. (d) Ability to assemble computers. Ques 8- The software application that is used the most often is …………..
(c) both circular tracks and sectors. Ques 11- What is the function of the justification buttons on the toolbar ? (a) To display a drop-down list of justification options. (b) To display the four options for aligning text. (c) To open the justification dialog box. (d) To centre the current line. (a) checks data for accuracy. (b) “does calculations using addition, subtraction, multiplication, and division”. (c) “does logical comparisons, such as equal to, greater than, less than”. (d) both calculations and logical comparisons. (b) “First, information is transferred to main memory and from there, the CPU reads”. (a) W3C (World Wide Web Consortium). (b) IETF (Internet Engineering Task Force). (c) Inter NIC (Internet Network Information Center). Ques 16- Excel has a number of features that make it a very powerful spreadsheet program. What features below is NOT a major advantage to using EXCEL ? (b) Automatic calculation of numbers and formulas. (a) a set of tools reserved exclusively for Internet Administrators. (b) short for United States Electronic Network. (c) a bulletin board system that allows for posting and responding to message on the Internet. (d) a precursor to the Internet that is now obsolete. (a) “Input, output and processing”. (b) “Control unit, primary storage and secondary storage”. (c) “Control unit, arithmetic-logic unit and primary storage”. (d) “Input, processing and storage”. Ques 20- What is the control unit’s function in the CPU ? (a) to decode program instructions. (b) to transfer data to primary storage. (c) to perform logical operations. (d) to store program instructions. You are now on the Page No 1 of this CCC Question Answers Bank SET-C. Complete Answer Keys for CCC Previous Year Question Paper Set-C on Page no 4 of this Post.